This topic contains 3 replies, has 2 voices, and was last updated by Amigo2k 7 years, 9 months ago. 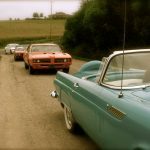 This car Cruise Night happens every Thursday and is just outside of Madison. Typical country bar setting with some nice out door seating. Looks like they had a pretty good turnout. That is just past Yahara golf course, isn’t it? yes just past the golf course….